Kraxberger Milddle School's Gearheads Robotics Club students have the opportunity to participate in two competitive robotics teams and can join the Gladstone e-recycling club. "Our robotics teams give 30 students the opportunity for hands-on learning in fabrication, electronics and computer programming," Principal Len Reed said. "While they learn CAD, computer skills, 3-D printing, and tool use, they are also building reading, writing, public speaking and planning skills. The interpersonal skills they build working as a team are an added bonus." Coach Shawn and Assistant Coach Kelley Price also make opportunities for students to learn about real-world applications and career opportunities in robotics, recruiting mentors from local businesses and guest speakers such as the bomb squad. "What they learn after school has direct benefits in the classroom, where students begin to see connections to what they are learning in math and science," Reed said. "This is definitely a motivator for kids to succeed academically." One way the club raises funds is through the e-recycling club, a training ground for students hoping to earn a spot on the robotics team. 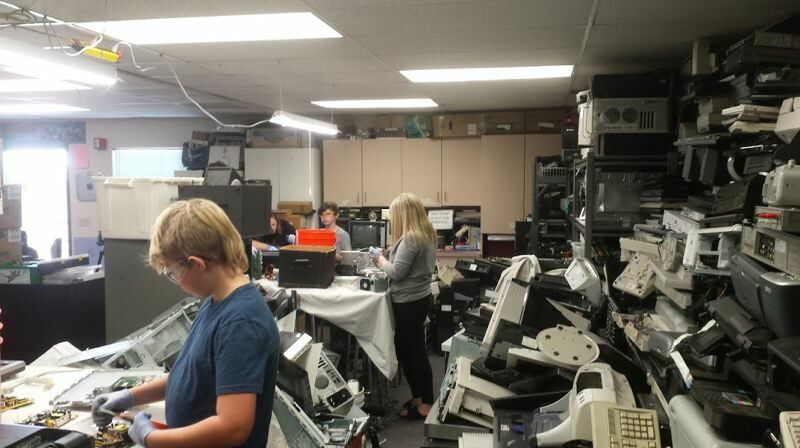 The group gathers donations of old computers, VCRs, radios and kitchen appliances, then dismantles them and recycles the parts to raise funds. The club often gathers old electronics at community events like the Arbor Day celebration or the city's annual Spring Cleaning event. "Taking things apart is the best way to learn how machines work," Price said. The fundraising effort has proven so successful that once enough cash is raised for Gearheads projects, students donate the extra money to various programs at their school. So far, beneficiaries have included $500 to the band program, $500 to the physical education program, $500 to Student Leadership, and $1,000 to the school's Kraxberger Rising campaign to provide student support programs. "We let the students decide where they want to contribute," Price said. "The kids are so proud that they are able to give back to their school. It motivates them to raise even more." The Gearheads frequently are involved in community service projects,from organizing children's events at the Gladstone Community Festival to tackling volunteer projects at the Gladstone Nature Park. "Community service is the Gladstone way," Price said. "We want kids to understand the importance of giving back to all the organizations who have supported our program."